Swimming Nature, the largest independent provider of swimming tuition in the UK, has developed a unique program of tuition for pool operators and private tutors to help deliver excellence in tuition and improve the level of swimming ability across the country. The Amateur Swimming Association (ASA), says that over 45% of children aged seven to eleven cannot swim the length of a standard swimming pool (25 metres) unaided. This means that 1 in 5 children enter adult life unable to swim, which contributes to approximately 400 UK deaths from drowning each year in the UK. As a result of these figures, parents have become increasingly concerned about the standards of swimming teaching in schools, and are now looking outside of the school system to find lessons that can help support and enhance their children’s personal development. Now, with the support of multiple World champion swimmer Mark Foster, Swimming Nature, who first pioneered the ‘in-water’ method of teaching in 1993, and have taught thousands of children and adults how to perfect their swimming technique, are looking to tackle this issue, by working with pool operators, local authorities, schools and private tutors across the UK to deliver an approved program of swimming tuition, to help meet demand and improve tuition standards throughout the country. “Swimming is an essential life skill as well as being a fun activity for all the family. Swimming allows people to stay fit as well as being a vital skill required for safety, yet the provision for teaching children in the UK is inadequate” said Founder and Managing Director, Eduardo Ferré. The 2013 National School Swimming census found that 51% of children aged 7 to 11 could not swim 25 metres unaided. The method used also tends to be the “multi-stroke” method. Eduardo continues: “Because of this and the sheer scale of the problem, Swimming Nature strongly believes that only in partnership with pool operators, start-up businesses, and independent swimming instructors across the UK, can we really tackle the problem”. Swimming Nature are now looking to expand their business and offer our proven programs and processes to more sites and more private tutors across the country. Their aim is to help increase the number of classes available across the UK, as well as set better standards for swimming tuition in the UK. The Swimming Nature program offers pool operators, entrepreneurs looking to start their own swim schools, and individual swimming instructors, training and coaching on their unique methodology, believed to be the most advanced swimming tuition method in the world. The modular training programme builds on teacher’s skills, covering all four of the main types of swimmers: babies, children, adults and advanced ‘triathlon’ swimmers, and provides a range of personalised teaching programs and lesson plans, based on pioneering scientific research, observation, and an understanding of cognitive development. For pool operators, and entrepreneurs looking build or grow their swim schools, Swimming Nature also provides access to a suite of software and business management tools that cover every element of running a successful tuition programme. From setting up as a company to day-to-day scheduling, budget controls, and bookings, to communicating with staff, customers, clients and colleagues, each program provides detailed business and monitoring systems to easily control and manage the teaching operations across individual or multiple sites, as well as marketing and PR support, helping businesses maximise revenue opportunities, and the greatest possible ROI. Unlike any other system available in the market, Swimming Nature’s central management system offers ongoing support to all of its partners and regular assessment and monitoring, ensuring the highest possible standards of teaching are employed across all sites. “Swimming Nature is dedicated to excellence in business. Our technology significantly improves efficiency, making the pool operators’ and instructors’ lives as easy as possible, whilst providing them with maximum control of the tuition activities, and setting better standards for swimming tuition across the UK” says Eduardo. 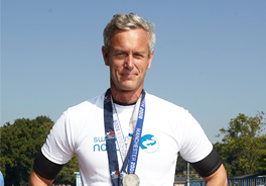 World champion swimmer and GB Olympian Mark Foster comments: “Swimming has a unique role in society today, providing a great deal of enjoyment for all the family making people safer near water, In addition to helping to deliver the Government’s health agenda”. Swimming Nature is appealing to entrepreneurs and instructors across the UK to get involved and help deliver excellence in swimming tuition for our children and adults by adopting their unique programs.